The Pop-Up Studio NYC: What's Popped Up: Carol Barton's Newest Book! What's Popped Up: Carol Barton's Newest Book! Here at the studio we're always looking for new pop up books, and I have to say we're very excited for Carol Barton's newest book, The Pocket Paper Engineer, Volume 3: V-Folds (it comes out in May!)! 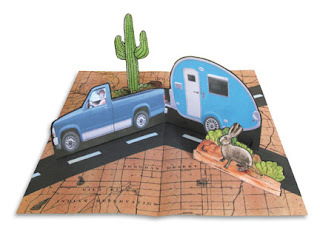 Ms. Barton has created many pop up books and instructional pop up books that I recommend to people who want to learn more about making pop ups. This third volume deals with V-Folds and how to create and integrate them into your pop ups. This book is filled with tutorials and has ten do-it-yourself projects that are inside the book! You can check out more about this book and pre-order it on Ms. Barton's website.